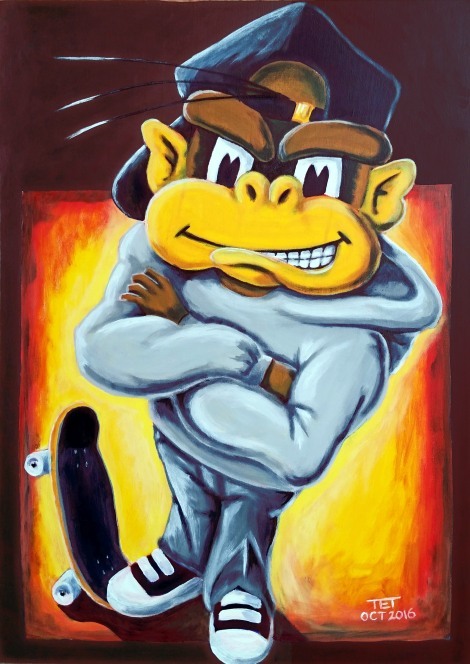 For this series I've created the pictured acrylic painting on 50 x 60cm canvas (above) of my Cage Monster Character - so named because I created him over twenty years ago as a logo character for my local skate park, known as The Cage. I will be using this work as an example of how far and wide a single artwork can be used so you don't have to create new art quite so often. Regardless of what type of art you create, documenting and sharing the creation process is a great way to keep your buyers engaged in your work, as well as attracting new buyers. It doesn't take a lot of work and it creates a narrative around what you do that people can 'tune into' as part of their day. Writing a blog is an ideal way to do this because it keeps everything in one place and shows a natural progression. Include work in progress photos and write at least a couple of paragraphs describing what challenges you faced in each stage. Once you finish each artwork you could use your blog to publish a companion book, to sell, showing its creation. Blog2Print or Designrr makes creating a blog book easy but if you want more control over layout and design, Blurb or Lulu are your next best print on demand self publishing options. If blogging seems like too much writing then documenting the process through social media is a great and more immediate option. Post photos and snippets of text, during your break, of whatever you've been working on. It takes seconds, your work is documented and often you'll get immediate feedback from your followers (be careful not to let them distract you from your art though) and even attract new followers. Traditional Art, such as drawing on paper, painting, sculpture... anything where the art is created outside of the digital realm is, by it's very nature, hands on, and usually very visual (in that observers tend to enjoy watching traditional artists work). If you are such an artist you should very strongly consider filming the creation process of your work and learn how to edit it down into short video presentations. Mini documentaries about how each work came into being. Smart phone cameras are ideal for this as most have HD cameras. You may even be able to edit your videos on your phone too as mobile video editing applications are becoming almost as feature rich as their desktop counterparts. If you can't find a good app, WeVideo is a cloud based video editor you might like to consider. If you're camera shy you don't have to appear on, or talk to the camera if you don't want to. Speed Painting is a very popular approach where you film yourself creating your art then speed that footage up anywhere from 15 to 30 times faster. Viewers can then see your art take shape in minutes rather than the hours (or even days) it actually took. Many artists do this and overlay a music track (be sure to use royalty free music). 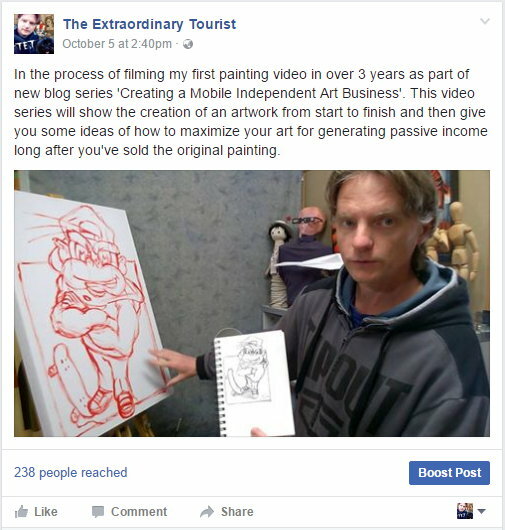 Videos showing the creation of your work can be a great selling tool for not just the artwork being created but all your artworks. Uploaded to YouTube and to your social media accounts they can easily be shared, raising awareness of your art. Video has been my medium of choice for sharing my own work. I use a combination of me talking to camera and speed painting. Usually I'll introduce the work, tell the viewer a little bit about its inspiration, show them my working sketch and then transition into the speed painting where they watch the work take shape over the course of a few minutes. The image above that I shared on my Facebook page is actually a still from my video footage of which part 1 is shown below. For digital artists (those of you that sit in front of a computer much of the time) you may think the creation process isn't going to be that interesting for video. However screen recording your art as you work and turning the footage into speed paintings is by far, one of the simplest things you can do. No camera set up or lighting issues, just press record on your screen capture software and work away as usual. If you have an Android device AZ Screen Recorder works well and lets you record either just your voice or inset video from your devices front camera (of you) talking as you work. That said, not all digital art is created by sitting in front of a computer the entire time. If you're a photographer you could document a photo shoot. If you do a lot of research, offline, or scout locations and other references to incorporate into your digital art, then document that. The bottom line is, people are interested in how art is made, whether it be for just the enjoyment of seeing the process or they want to learn themselves how to create art like yours. It's an easy way to maintain interest in your art when you're not unleashing a new artwork into the world. Next post I'll look at photographing your art if you create and actual physical, real world piece of art. For digital artists I'll talk a bit about why you need to create your art at high resolutions if you want to make physical, real world prints.